Be it social-political (e.g., India, China, Africa, Southeast Asia [ICASA], Brexit, Syria, North Korea), new competitors (e.g., Tesla, Amazon, Uber, Apple), new technology (e.g., mobile, social marketing, cloud), or any of many more trends, changes are disrupting our status quo in complex ways. Global, industry, product and competitive trends increasingly point to less stability for most industries. Our traditional management toolkit, the one we have used our entire careers to think about our competitive environments, is based on known patterns- like best practices. However, these traditionally linear, cause-and-effect models are proving mostly ineffective for the dynamic marketplace where new entrants materialize from other sectors, other industries, and all geographies, seemingly overnight. How do you know what to do? How do you manage in a volatile, uncertain, complex and ambiguous (VUCA) world? When, if at all, should you apply specific management approaches? When and how should we consider dynamic approaches like Agile Management, which has been forged out of the progressively dynamic environment? We have been injecting agile techniques into our client engagements, long before the agile manifesto, and we are ardent advocates. However, there are parallel models, and the collective wisdom of the business world continues to expand our thought processes. Through a survey of recent publications combined with our experience, we thought we might pull a number of popular concepts and frameworks together to shed some light, and possibly a helpful insight or two, on “how to” lead and manage in a world of increasing uncertainty- a VUCA world. If you factor-in the “why” many organizations are turning to agile from VersionOne’s “11th Annual State of Agile Report,” we begin to see a little more complete picture. If you ask why are speed, flexibility, productivity and transparency driving agile’s popularity, we believe you will find increasing VUCA is driving organizations to look for more nimble approaches to management and execution. Many are reaching for the agile toolkit because of the increasingly VUCA environment. They consider getting to “one of the best” solutions more quickly as being more valuable than being later with “the best” answer. Volatility, uncertainty, complexity and ambiguity (VUCA) is a term originally used to describe the post-cold war environment. Over time it has been gaining traction within the realm of business. And, while there are a number of variations on sense-making frameworks, the most elegant model to help manage VUCA may be the Cynefin framework initially developed at IBM and currently providing a basis for some versions of agile. How did we arrive at the Cynefin (Welch for habitat, sense of place) framework? If we go back to Secretary Rumsfeld’s known-known and unknown-unknown quotes, we will find a correlation to the Johari window. Johari is based on two dimensions of “known to self” and “known to others.” The Johari window provides a 2 x 2 matrix for known solutions. But, think about different situations. What if you are in the wrong window pane? What if there is no right answer? How do you deal with chaos? How should you be thinking about black swans? The Cynefin framework offers five domains to consider how to think, and act, as a leader, manager, and organization within situations at all levels of uncertainty. Quickly highlighted in a sidebar of an HBR article “A Leader’s Framework for Decision Making,” the Cynefin framework constructs domains to address increasing levels of VUCA. And, through definition, differentiates between five domains: Simple, Complicated, Complex, Chaos and Disorder (see next section “Cynefin Framework for Analyzing and Managing Uncertainty”). It is the concept and domain of “Disorder”- where management is using the wrong approach- Cynefin provides more rigor than many of the alternative frameworks we have encountered. Apologies in advance to die-hard Cynefin fans, as we have taken graphical liberties to align the domains of the Cynefin framework with key managerial characteristics, metaphorical bolt-ons from other writers, and our own future-of-management point-of-view in the following. Historic management practices are based on Taylorism, stability, calculable risk, and a simple- best practices- environment. But, as Harvard Business School’s Dean Nohria stated, “a stable equilibrium is unnatural” and “uncertainty is incalculable.” The Cynefin framework defines domains and provides approaches to support leadership and management under all levels of uncertainty. As with most frameworks, depending on the context, the analysis can be applied across the entire enterprise through a portfolio approach. Also, the analysis may be applied to, for example, a single instance: a product line, a division, a topic area, or a specific issue. For those in industries and sectors which are stable with known performance frameworks- those in the Cynefin’s simple domain: apply best practices, leverage what has worked before, and continuously improve. For the rest of us facing increasing VUCA, the question is How do we lead, manage and execute differently? In addition to the management techniques in the table above, the following sections overview several emerging approaches to align leadership, management and organizational activity within Cynefin domains. Just as no two companies are exactly the same, in the same situation, with the same product mix, there is no one-size-fits-all best-approach to uncertainty. Even though agile techniques can be applied in each of the Cynefin domains, there is no consensus on what constitutes an agile approach. Strategy, culture, leadership, management, and an industry’s Cynefin domain must all be considered when striving to achieve targeted outcomes in uncertain times. There are, however, characteristics which are common across instances of agile’s application. Some of the most common benefits, techniques and challenges of agile can be found in VersionOne’s “11th Annual State of Agile” report, which are excerpted in the following. While many agile techniques are popular, there are quite a few capabilities beyond agile, or possibly best blended with agile, to aid in leading, managing and executing in a highly VUCA environment. How should we lead and manage in dynamic situations- those where both employees and organizations embrace uncertainty? Leaders must consider the willingness of the workforce to assume personal risk. “The whole concept of the all-knowing, omnipotent leader is over. Employees know this isn’t reality- and value a more candid dialogue” according to a change consultant quoted in the MIT SMR article “Embracing Uncertainty.” However, this will require a change in culture, including encouraging risk, and a more transparent, two-way communication- both based on a change in behaviors. The Economist’s Managing Uncertainty, reinforces these themes including chapters on strategic anticipation (e.g., flexible planning), navigational leadership, agility, resilience, collaboration, and learning. And, to focus on the implications of uncertainty relative to strategy for just a bit, the need to consider increasing speed (e.g., from housing bubble to the great recession), interconnectivity (e.g., Arab spring of 2011), and cyber-attacks (e.g., both political- Russia- and commercial- Equifax) as just a few considerations defining a wide-ranging view of the future. “Strategy Under Uncertainty,” now an HBR classic, discusses four levels of uncertainty (e.g., clear- single view of the future, alternative- limited set of outcomes, range and ambiguity). And, like Cynefin, each level comes with a recommended tool kit, incorporating, for example, game theory, scenario planning and pattern recognition. Most of these tools are still relevant today, depending on your Cynefin domain/situation. Immediately following the unexpected U.S. 2016 presidential election results, the business press was awash with articles on uncertainty. One such article, by Reeves of The Boston Consulting Group, implored an investment in strategic resilience including redundancy, diversity, modularity, adaption, prudence, and embeddedness. Each of these capabilities extend far beyond the traditional risk management approach (e.g., mitigate, avoid or accept risk). Another MIT SMR article suggests that when “Managing project uncertainty” (both an action and the article name), creating uncertainty profiles can help at a tactical level. These techniques, and others, can provide a more robust tool kit to enable leaders and managers to both enhance and extend beyond agile. Another area for consideration is business strategy’s scenario planning which has proven a robust technique for thinking about uncertainty for decades. Like agile, “there is no cookie-cutter method” of “Using Scenario Planning to Reshape Strategy,” both a summary and a title of a recent MIT SMR article. The article also includes the concept of the contextual and transactional environment, emphasizing the role of the strategy-environment interaction. Shell’s use of scenarios in strategic planning is demonstrated in a number of exhibits in the California Management Review article, “Three Decades of Scenario Planning in Shell.” For example, “Bringing Scenarios to the Business” demonstrates the idea of scenario layers driving down from Global to Focused (e.g., Country) to Project (e.g., investment decisions) with explicit definition of implications at each level. In our experience, scenario planning remains as much of an art as it is a science. Its most important impact may be facilitating leadership teams’ mindset away from linear forecasting and toward multiple paths with alternative visions of the future- requiring the necessary flexible capabilities based on impact (e.g., consequences) and some level-of-certainty of occurrence (e.g., probability). When thinking about how to develop, manage and leverage the dynamic capabilities of agile, capabilities for managing uncertainty, and scenario planning, we have created an enabling approach to change, based on dynamic social networks. GE’s vice-chairman, John Rice, describes the company’s efforts to bust silos, increase collaboration and build internal marketplace of ideas and solutions through social networks in a recent McKinsey Quarterly article. Based on our work with clients and thought-leading practitioners over the last decade, we have developed an integrated approach on how-to manage and lead Dynamic Social Networks. The basis of our Dynamic Social Network approach is founded on three key elements. Uncertainty has always been with us. However, as today’s trends blur traditional boundaries, the Tayloristic management paradigm of the 20th century, linear by design, needs to be supplemented by a faster, more nimble approach to achieve speed and flexibility through agile, integrated with traditional and “beyond agile” capabilities and methods. Agile characteristics such as short sprints, roadmaps and minimum viable product, complemented by individual capabilities, scenarios and networks, can help you and your organization to support, to integrate with traditional, siloed-hierarchy, to execute processes and projects in all Cynefin domains- each with their unique mix of volatility, uncertainty, complexity and ambiguity (VUCA). Good luck in your journey to find the right blend of agile, uncertainty management capabilities, scenario planning and networks with traditional leadership, management and execution approaches. You now have at solid introduction to frameworks and a way-of-thinking to help you make you sense of various levels of uncertainty, and to provide a winning combination we refer to as Business Velocity- the integrated approach needed to sense and respond quickly in today’s VUCA world. These endnotes represent specific reference materials used in preparation of this post. As there are a number of topics pulled together for this discussion, the notes are sequenced to build on previous references, and, hopefully, make any additional reading easier for you. We have utilized this approach in lieu of formal footnoting or bibliography. Also, a few summary comments are included with most citations. The comments are meant to give you a sense of the cited resource. Please note the citation summary comments may, or may not, have been specifically addressed above. Essential Scrum, A practical guide to the most popular agile process, Rubin, Addison-Wesley. 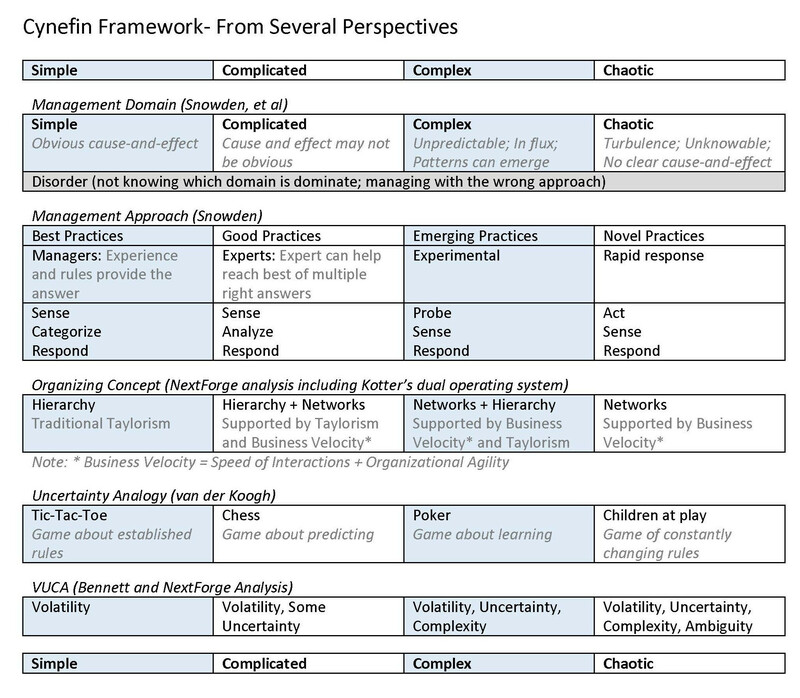 Discussion introduces and frames the concept of domains of uncertainty within Agile; See Cynefin domains, p 7-9. Sense and Respond, How successful organizations listen to customers and create new products continuously, Gothelf and Seiden, Harvard Business Review Press. Through a two-way conversation with the continuously changing marketplace, collaborative learning through sense (listening) and respond (acting). The sequencing of a continuous feedback loop with the marketplace through concepts, like Sense-and-Respond and OODA can be adjusted to align with Cynefin domains of uncertainty. Also see introduction of outcome focus versus output focus, p 116. McKinsey has published a piece including 18 agile practices for organizational agility. See “How to create an agile organization,” McKinsey Survey, October 2017. Upon revisiting the 2017 McKinsey survey, McKinsey correlates companies with more complete agile programs (“the ability to quickly reconfigure strategy, structure, processes, people, and technology toward value-creating and value-protecting opportunities”) within industry sectors characterized by high-levels of change, unstable environments, and volatile or uncertain environments. “Clearly, most companies want to be more agile. But most companies don’t appear to have the culture to support this.